Marshmallow PEEP Bunnies! | Create! 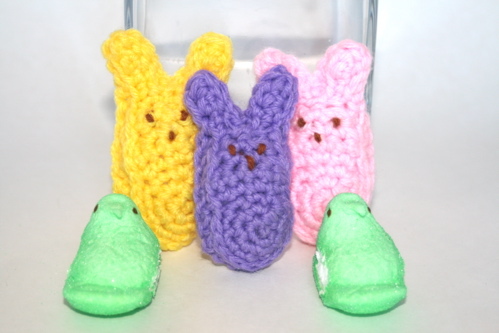 The PEEPS folks are highly protective of their Copyrights, as they should be, so last year a bunch of us Etsy sellers making PEEP-like items had to take down our items, even if we weren’t using the PEEP name. Waaaah! But I understand. Of course we complied, but luckily, even if we can’t sell these items, YOU can make them! 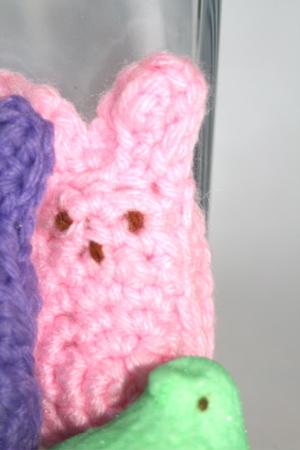 In my case, I had designed these crochet bunnies. (So, you know, make them as gifts for yourself or others, but don’t sell them). This forms the bottom circle of the body. The top half is worked by moving across and turning at the end of each row. Turn the work so that the right side is facing you without making a Ch 1 turn. Ch 5; sc, hdc, hdc, hdc, skip the next sc and sl stitch into the last sc. Finish off. This is the “front” of the bunny. With a brown yarn and needlepoint needle, make two eyes and a nose. There’s no exact way to do this, but I made each by coming up with the thread and going down vertically in another spot very close by. It took me a couple tries to get it right. You could also use beads to make more uniform eyes and nose. For the body, single crochet into the inner loops to give the bunny some depth. When you’re working the part of the bodies that aren’t the circles, there are no inner or outer loops; single crochet here. For the ears, slip stitch together. Stuff the body, but not the ears, when he is about 2/3 stitched together. Finish off. Eeek! I LOVE THEM! Thank you so much for sharing this with us! I am making one for both my kids and my nieces and nephews! Oh that’s a bummer people had to take them down after changing the name. Are we still allowed to call them Peeps on the blogs? I hope so, I linked to a bunch this year! wow-these are fabulous. I have been a peep fan for years and actually went to college near their factory (but they of course stopped factory tours the yr before I started school). p.s. glad to hear you share my quest for the green tea kit kat! Good day it was a pleasure visting your blog. Your peeps are adorable but your instructions are very unclear.i finally figured out what you are saying.